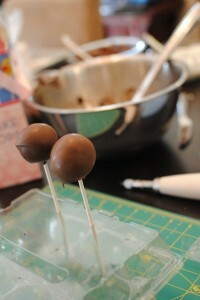 My friend Sara came over today and we had so much fun adventuring into the world of Cake Pop making. I’d never really made them before, but I think they turned out well. After many laughs and UFO shaped pops, we ran out of room on my store bought display tray and needed to find a way to display the cake pops while we were waiting for them to set. I have seen many different ideas, but thought I would share a couple that I found (including a great DIY!). 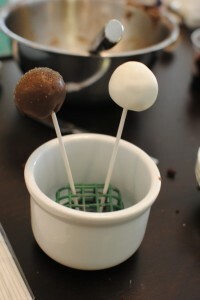 To make the cake pops we used Whole Foods chocolate cake mix, handmade fudge frosting from Cake Works in Campbell, CA, and Guittard Coating Chocolate. 1) The first is your general cake pop display that comes with the Bakerella Cake Pop Making Kit. My mom gave me this great kit for Christmas and I finally got to use it! 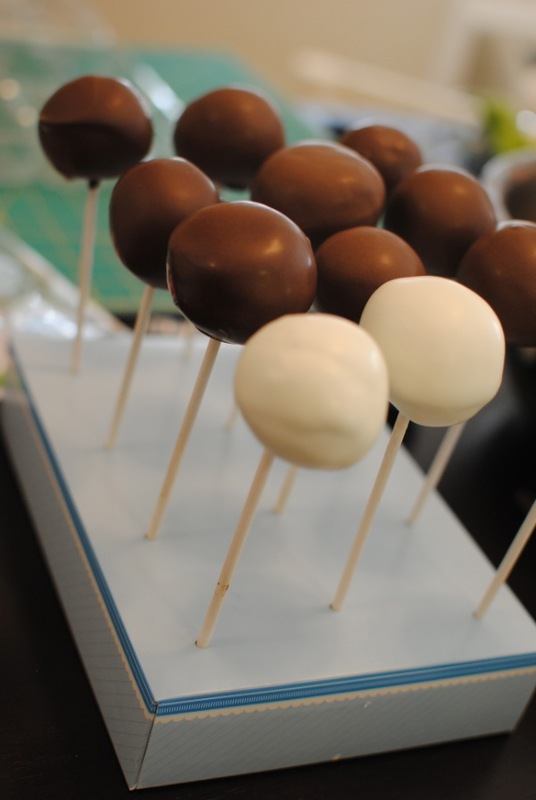 This works exceptionally well, but I was worried that I might drip some chocolate on the pretty paper and it doesn’t store that many cake pops on its own. This might be best for showing off decorated cake pops that are already set. 2) This is a vintage floral “frog” that I picked up at an antique store on a day trip to Pescadero, CA. At first I had no idea what in the world this beautiful little green thing was. I thought it would be perfect to photograph jewelry on (which I also have done here). The sales associate told me it is used at the bottom of a vase to hold the stems in place. Genius. 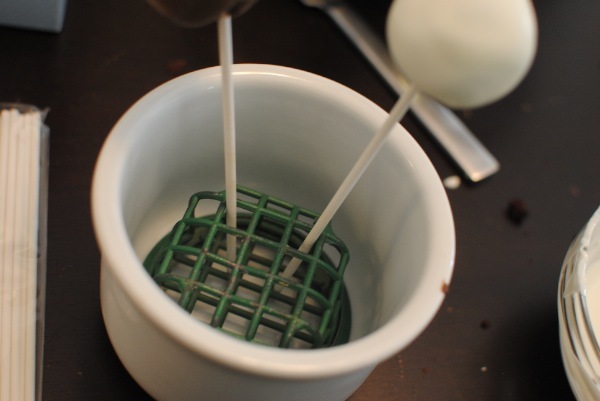 Here, it also holds the “stems” of my cake pops in place. 3) The third great idea came from Sara. 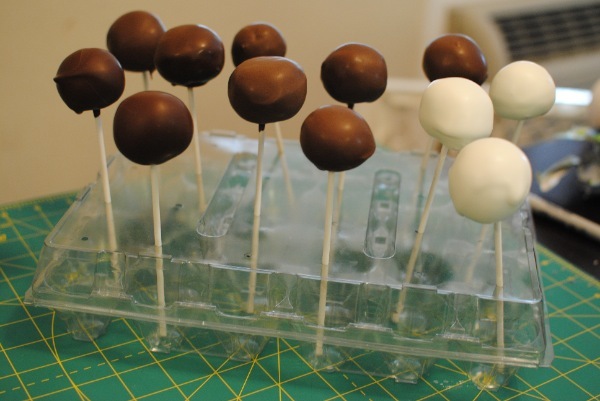 I was complaining how I was running out of space for cake pops to dry and she asked if I had an egg carton. How smart! I pulled this one out of my recycling bin and grabbed my Martha Stewart Screw Punch. This tool is awesome. 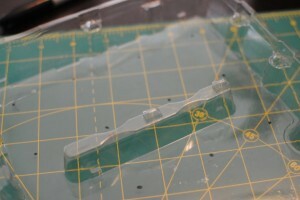 I have used it to cut everything from plastic to chipboard to leather to fabric. I really like this DIY display because it is cheap, easy to wipe off, and I don’t feel guilty if my chocolate drips onto it. Another great thing is that it can hold 18 pops at one time (yay Costco!). Click CONTINUE READING for the full tutorial on how to make this display. 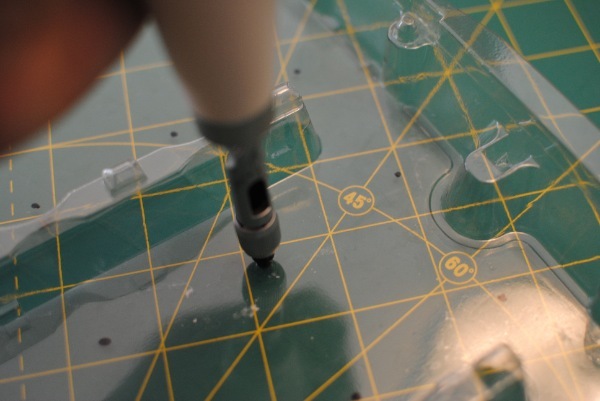 Using a sharpie, mark where you want your holes to be on the lid of the egg carton. Punch the holes out and close your egg carton. 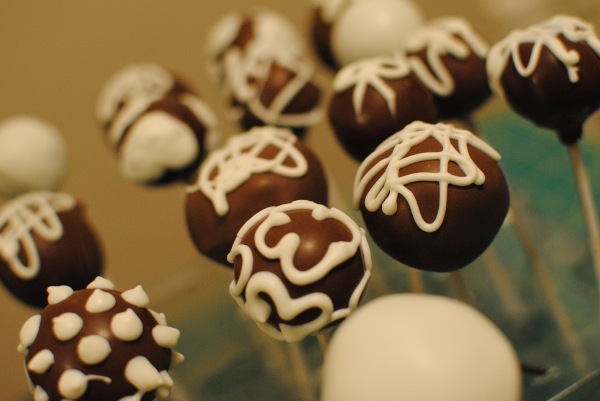 Fill with yummy cake pops and enjoy! « Spring Sale in My Etsy Shop!